The construction business is a very aggressive and demanding industry. While some of us work on our shops or install or provide services on a customer's property, the proper liability insurance must be obtained to protect our assets and take control of our liability. A good builder liability insurance coverage can protect against injuries, accidents or property damage suffered on the job. Furthermore, construction workers can accidentally damage a property mishandling materials and tools, or while a remodeling process is underway. With many jobs, especially on government contracts, it is a requirement to provide evidence of liability insurance as part of the qualification process. Subcontractors also are required to present their evidence before entering or starting their participation in a construction job. It will protect your business against injury and/or property damage. Liability insurance will assist you in covering costs and damages after a judgment has passed. It provides a certain level of value and security knowing that your assets and employees are protected. It can be used to cover the cost of attorney fees, witness fees, court expenses, and more. The construction liability will protect in many different ways: your company as a whole and individual claims against the company. Injury claims: The policy might be used to pay for medical expenses, funeral, and court-awarded compensations, This coverage is not a worker's comp type of coverage. Damage claims: The insurance will protect you when your company damages the customer's property or if your business is responsible for their inability to use that property. Product claims: Claims related to damages caused by equipment installed by your company, can be managed and addressed through the liability insurance coverage. Copyright claims: If you own a design or product, you might be sued for copyright infringement when it is very similar to your competitors'. The cost associated with your liability insurance will depend on the risk perceived with the type of work you are doing. If you are in a business with low risk, you might want to consider coverage under the Business Owner's Policy rather than liability insurance. Normally, commercial contractors with a higher risk of damages, for example, a roofing contractor, or contractors who perform highly specialized trades are the ones with the biggest insurance coverage. Indemnity corporations charge policyholders a modest down payment and monthly fees to finance premiums over six months to a year. The amount of the liability insurance is directly related to the amount of money that the contractor is executing, and it is recommended to have insurance coverage of two or three times the amount of construction project budgets. It is important to be insured by a company B rated at a minimum; higher is better, just like grades. When your insurance company is rated C or lower, it might be a sign that the business will be out of business soon or that you might have problems when processing your claims. 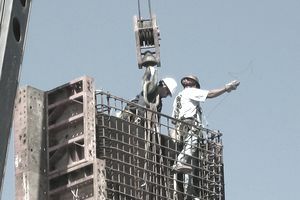 Construction liability insurance also has its limitations. You must set limits per each occurrence and limits for aggregated values. Limitations are also set for fire damage to property under construction as well as medical expenses for injured workers on the job site that might not be covered under workers ’ compensation. Covered damages also include liability for personal and advertising injury; that is litigation produced from claims that the contractor's promotional advertising in some way caused the homeowner or another interested party to incur a financial or personal loss. No matter how large or small the job, in the building trades, having adequate insurance against liability is always the best policy.